The tree, located in front of the Parliament Building, was this evening lit by Valletta 2018 Chairman Jason Micallef. The tree, as well as other Christmas installations found at Pjazza Teatru Rjal, are made by Mdina Glass. The Chairman of the Valletta 2018 Foundation Jason Micallef, together with the Mayor of Valletta Alexiei Dingli, this evening lit a Christmas tree outside the new Parliament Building, marking the start of the festive season in Valletta. 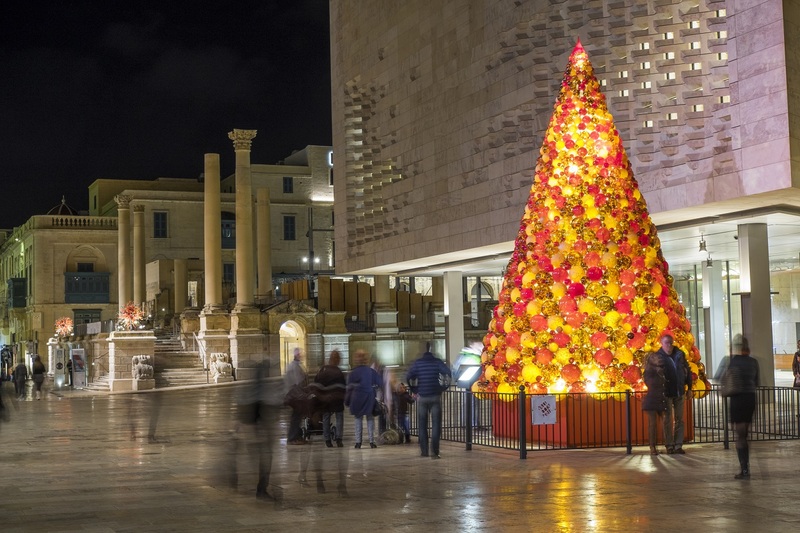 The Christmas Tree, as well as other installations at Pjazza Teatru Rjal, are made by Mdina Glass and will be on display for the rest of the month. The large Christmas tree in front of Parliament building with other Christmas installation (also by Mdina Glass) in background at Pjazza Teatru Rjal.